Your pet hamster requires a safe cage that provides room to run around, exercise, eat, and sleep. You can provide this as simply or as lavishly as you want as long as the basic requirements are met. When providing a cage you must remember he is a chewer and an excellent escape artist. He can chew through wood or soft plastic, such as the screening on top of tank cages. There are a variety of different habitats that you can choose for your hamster’s home. A wired bar cage as an excellent home. Just make certain the bars are close enough together that your hamster can’t wriggle through. Be sure that any door can be securely latched, your pet is capable of moving a sliding door with his teeth and escaping. A glass aquarium with a screened top can also be used as a home. An aquarium has corners that a hamster likes, it’s high enough to add an exercise wheel, and he can’t climb glass making it almost escape proof. Tube cages, like CritterTrail, are expandable habitats. With lots of interlocking tubes, wheels, lookouts, and other add-ons, the type of home you can make for your hamster is unlimited. A tube cage can be like a mini playground. The size of the cage depends on what type and how many hamsters you intend to own. A cage that is 15 inches long by 12 inches high is appropriate for one hamster or two dwarf hamsters. For your pet, bigger is better, so go with the biggest cage possible. The larger the cage, the happier your hamster will be. Once you have picked out the perfect home, you need to fill it with everything he needs to have a happy and healthy life. Sources of food, water, bedding, and toys are all important to your hamster’s well being. 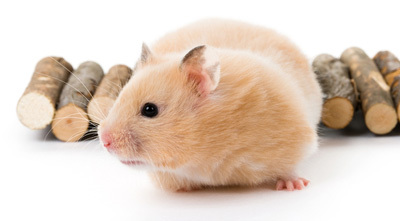 Your hamster will need a source of fresh water. He will fill up water dishes with whatever he can find in his cage, so a stoppered water bottle that attaches to the cage works best. A dish for food. Hamsters prefer their food to be near the sleeping area and are hoarders. You can use food dishes, but be aware that he will quickly empty it as he constantly relocates the food. Your pet will need a bedding or substrate. They are burrowing creatures and will be much happier if they have something to burrow in. There are many commercial beddings made from wood shavings and pellets made from wood, alfalfa, pecans, sawdust, corncob, walnut, and recycled newspaper. Do not use clumping kitty litter or cedar based shavings. Hamsters eat a portion of their feces as part of their digestive process. Clumping litter can cause intestinal obstruction which could lead to your pet’s death. Aromatic oils in cedar based shavings are irritating to a hamster’s respiratory system. Your hamster needs a sleeping area and any small container will work. This container must be big enough for ventilation and for your pet to turn around in. It should also be easy to clean or inexpensive enough to throw away and replace if it becomes soiled. Cage enrichment is the toys and items that will keep your pet busy, active, and happy. Things he will enjoy include wheels, pipes, tubes, chew blocks, wooden toys, and balls. Luckily, there are many commercially available hamster toys that will keep him happy. It is important to clean your pet’s cage about once a week. Replace the substrate and bedding, wash the food bowls, and change the water. You can also wash other parts of the cage that smell with soapy water. Be sure to dry everything before putting items back in the cage. While cleaning, be sure to keep your hamster someplace safe to prevent escape. A trash can, deep bucket, or a bathtub with the drain plugged are good places to temporarily keep your pet.